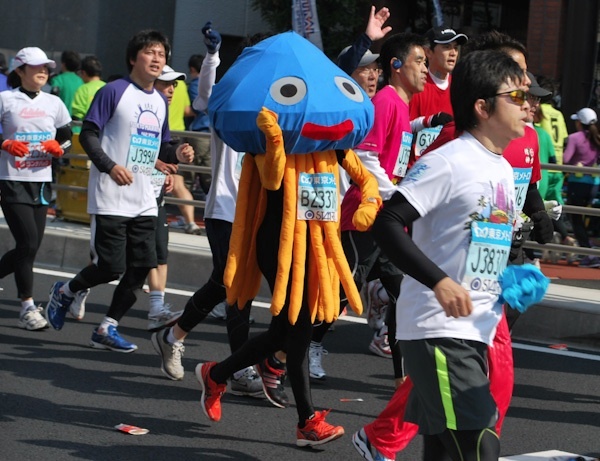 Looking for something fun to write about tonight I came across a set of pictures showing runners completing the recent Tokyo Marathon in costumes ranging from animals to Star Wars characters to Waldo. You can view the pictures here. Personally I am surprised people were able to finsh the marathon in some of those. I can,t imagine how hot it must have been to complete 42 km in some of those costumes. Speaking of costumed marathon runners did you know there is a Guinness World Record for the fastest superhero in a marathon? In fact, the record was recently broken by Ian Sharman who completed the Napa Marathon in 2:40 while dressed as Spiderman. You can read about it here. So far I have not come across many costumed runners. The only I can think of are the three soldiers I saw dressed in combats and gas masks when I ran the Army Run half-marathon two years ago and the guy guy in a puffy shirt and kilt at the Prince Edward County Marathon in October. What are some of the best costumes you have come across at races? On another note, I mentioned here earlier that the Ottawa Marathon Course was changing. The changes were announced today. I will provide my thoughts later in the week but for now if you want to read about the chagnes head here.